Our Zoo Warlock deck list guide features the best Rise of Shadows deck list for Season 61 of Hearthstone (April 2019). 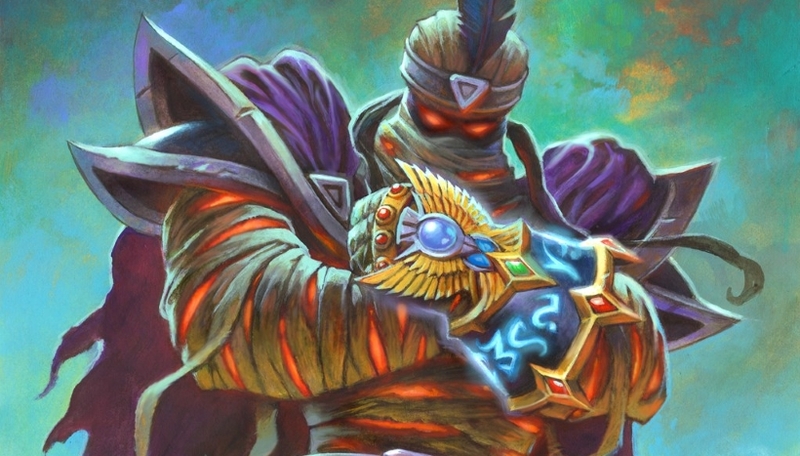 Our Zoo Warlock guide also contains Mulligan advice, card combos and strategy tips. Zoo Warlock is a Hearthstone deck that we see crop up at the start of each expansion time and time again. What is it about the archetype that makes it so popular, though? Well, it tends to be a very cheap deck to put together so new or returning players tend to gravitate towards it. It’s also great for beginners to try out as it teaches you many of Hearthstone’s fundamental skills and mechanics while still remaining competitive. The deck may not reach its glory days of yore, but that still doesn’t stop Zoo Warlock from finding a spot in the meta once again. The deck hasn’t received all that many new tools in Rise of Shadows – and has actually lost the heavy-hitting Doomguard – but a couple of new cards and the Lackey mechanic can slot into the list perfectly to round it out as decent replacements. So, whether you're a new player, or you've not sampled Zoo for a while now, we've put together a guide that features the best deck list being played on the ladder today. Given that Zoo will always have some relevance in the meta it’s generally worth investing your dust in. Further on you’ll find loads of strategy advice on how to play Zoo well, pick the best cards during the Mulligan phase, and we've broken down the card combos too. Zoo Warlock is all about taking control of the board with cheap minions in the early game and taking sensible trades with your opponent’s creatures in order to maintain that lead. By using the Life-Tap hero power, you can ensure your hand is full of resources to continue that constant pressure. With a lot of powerful early game drops, you can storm out into a lead early on and either overwhelm your opponent before they have a chance to respond, or close out the game with some final burst damage in the late game. While some players are already climbing to Legend in the new Hearthstone season with Zoo Warlock, the deck always seems to do well during the first few days of a new expansion launch. Don’t expect this dominance to last much past the first month or two of the new set release. Contest the board with your powerful early drops and make sensible trades where possible. Remember, Zoo Warlock is a board control deck and not one for rushing face damage. Look for ways you can trigger dagger throws from Knife Juggler to get extra damage out either as face damage or to finish off your opponent’s minions. Similarly, any minion buffs can be used to trade up or push for extra damage to your opponent’s life total early. Continue applying pressure with your minions. Pairing them up with the effect from Magic Carpet is an excellent way to get more value out of those cheap drops, or you can buff a particularly wide board using Grim Rally. At this stage, you should consider weaving in a Life-Tap every turn where possible to ensure you don’t run out of resources or cast The Soularium to dig deeper into your deck. Just remember cards pulled from the latter are discarded if you don’t play them on the same turn so watch your mana costs! If you’ve stormed out into a lead then the game may already be over at this point, or you’ll at least be looking for that last extra chunk of damage. If you can, drop discounted Sea Giant and your opponent will have to find an answer for it soon, otherwise their life total will evaporate. If the game has reached turn seven, Arch-Villain Rafaam can be a fun way to look for the win if you get some particularly strong legendary minions from his Battlecry! 1. It’s even more important to trade cleverly against aggro decks, as Zoo Warlock has very few comeback mechanisms if you fall behind on the board. 2. Knife Juggler is particularly good against aggro if you get a couple of lucky dagger throws to finish off their equally low health minions. 3. Be cautious with Saronite Taskmaster, as the token it gives your opponent on death can be more impactful in a aggro deck that’s capable of many buffs. 4. Ensure you Life-Tap when you can, but be careful of doing so too aggressively and putting yourself on a dangerously low amount of Health. A fast aggro deck can reduce that to nothing out of nowhere. 5. The sooner you can drop a Sea Giant, the better, as aggro often forgoes a lot of hard removal for more minions. 1. Definitely play more aggressively against control, as you want to finish them off before they get a chance to stabilise. 2. At the same time, be cautious of over-extending into board clear if you know one could be coming on the next turn. Make sure you have some resources saved in reserve, just in case. 3. Be cautious of going all-in with a big Sea Giant play. All the hard removal in control decks may see it deleted in the blink of an eye. 4. You may need to rely more on Arch-Villain Rafaam for the win in longer control games. It’s not only a solid Taunt creature but you might find the right legendary or two to carry you to victory. 1. Flame Imp: Still one of the best one-drops in the game based on the stats alone and well worth the hit to your Health. 2. Voidwalker: A decent one-drop that can protect some of your other minions while slowly chipping away at your opponent. 3. Mecharoo: Another perfectly fine one-drop to start off the game with, plus it leaves a minion behind on the board when killed. 4. Argent Squire: A good sticky minion to drop at the start of the game so you can build and maintain your board presence. 5. Saronite Taskmaster: Similar to Flame Imp, there’s a downside to this card but it’s well worth playing for the stats to Mana cost ratio. - Use Grim Rally to kill your weakest minion once you’ve gone wide enough on the board. If you can hit three or more creatures with the buff then you’ll start to see some value from it! - The Soularium is a great way to refill your hand if you don’t want to risk a Life Tap, but remember you need to use all three cards on the same turn or you’ll Discard them. - Make sure you drop Dire Wolf Alpha in between two minions so they both benefit from the Attack bonus. Aim to do the same every time with Defender of Argus, too. - If Magic Carpet can survive for a turn after it’s played you can get some excellent value out of it as it’ll buff all your one-drop minions when played with one extra Attack and grant them Rush. - With all the cheap minions you’re playing in the deck you should be able to reduce the cost of Sea Giant significantly to set up a huge tempo play. - Both Grim Rally and EVIL Genius are ideal ways to crack Scarab Egg as its strength comes from being killed off – and these two cards give you bonuses. - Remember that when you play Arch-Villain Rafaam that ALL of the cards in your deck and hand will be converted into legendary minions. Make sure you’ve used everything else you want to first. These are some of the key cards in the current version of Zoo Warlock. As most are so cheap in terms of dust you shouldn’t need to look for replacements. Flame Imp: Strong stats for a one drop that you’ll happily take three damage for in order to assert yourself on the board early. Crystallizer: The negative isn’t too bad to get this solid drop on the board as it’s just a straight Health for Armor replacement. You can run Soulfire in its place if you don’t own this epic or want more burst damage. Grim Rally: Zoo Warlock often goes very wide on the board, so you can remove a weaker minion from the field to give everything else a significant buff for very minimal cost. The Soularium: Vital card draw to keep the pressure up as Zoo Warlock. As many of the deck’s cards are super-cheap you should be too worried about not having the mana to play everything you draw. EVIL Genius: A nasty downside but it’ll give you two one-drop minions with powerful effects that work well in Zoo Warlock. Knife Juggler: With all the cheap minions in Zoo Warlock you can get a lot of dagger throws off that can be hugely helpful as extra Health or minion damage. Magic Carpet: Offers a very nice buff to your one-drops that can ensure they have an more substantial impact on the board more immediately. Arch-Villain Rafaam: By the late game a lot of your early minions will have lost a lot of their potential so replacing them with random legendaries can often lead to hugely positive results if you get lucky. Sea Giant: You should have a wide board very often, so you’ll see substantial discounts on Sea Giant that mean you can drop it much earlier than intended. It demands an immediate answer from your opponent. @Stem argh!Argh! Reading comprehension fail on my part! Thank you for helping! @Stem then does that mean the Prince battlecry would not work with this deck? As out lined in this article? Or am being dense and missing something? I apologize, but I am not tracking this deck. It says to use The Prince, but that card text says that it only works if your deck has no cards that cost more than 2. But fungal mancer and doom guard and Spellbreaker are more than 2? So how does Prince work? Go to the hsreplay page here, and sort the decks by winrate. You'll notice 0 of the top 10 have soulfire infusion/doubling imp. The first popular list with those two cards is at 58% winrate and is playing sea giants and such. The more conventional soulfire infusion/doubling imp builds aren't until 56-57%. If you look at the statistics on hsreplay.net, the version of this deck with soulfire infusion and doubling imp is doing worse by a surprising amount (3-4% it seems). This is considering the winrate of the best zoolock lists on the site with over a few thousand games. I think you should update this guide to reflect that, as it really is an amazingly large difference considering how much more synergistic this list can feel. Here's the pre-expansion deck list which was updated on the 1st August. Use this in the days we have left before Boomdsay lands. Thanks for your patience as we get the site updated! @arjensmit75 Sorry I missed this - it had gone off the front page! (Do an@Bedders if you ever want to grab me personally). It's a bit of a shame that Zoo isn't really delivering right now. I'd hoped for a bit of a comeback in Un'Goro but it's probably not to be. Entirely useless to try and play this and hope for a win. @kirksteele90 Yeah it's an old favourite of ours. Shame it's not quite as competitive as it once was, as it's such a nice way of people to learn the ins and outs of the game. Thanks, built this deck with a few minor changes for cards i didn't have and won 2 games in a row already. Very easy to pick up and learn and as someone that hated warlock to begin with, this was a fund deck to play. @Klck I think you misunderstand how Leeroy is used in Zoo. You look at it as he's not an equal board presence to Doomguard, and that's true, but that's now why he's being selected. You can hoard Power Overwhelming and cast them on Leeroy for a huge end-game burst. You can't do that with Doomguard because they get discarded. Also, most of the 'locks I've seen on the ladder this past season have been running the discard version of zoo, with the imp and Silverware Golem. They DO run Doomguard because the imps return the lost cards. @koolcat1101 You r wrong mate, i was also. There are no downsides playing doomguard as you play it as last card in hand. Also leeeeeeeeroy hits once then hes dead, while doomguard hits and need to be answered or he hits again. Leeroy is good replacement while you have no doomguards. I prefer the version with leeroy Jenkins. Is Moroes a good replacement for imp gang boss? @Dimitriy at last but not least, 2/3 dude which spawn 1\1 boar is valid, harvest golem even better i guess. Who can i replace with imp gang boss? @harrisongrafanakis70 didnt notice no imps here, i would play 10 of them if able. No offence but If t5 giant is slow then we must be playing other games. @Klck Definitely valid. I think we're going to see a lot of changes in the first full month of Karazhan, now that every card has been released. It's quite hard to definitively call these deck lists right now. I'd encourage everyone to experiment with every variation right now, and if you find one that works in your corner of the ladder, stick with it! We'll have a better sense of what works within the broader metagame for the next update I think. Almost everyone playing zoo is using Kara kazham! over forbiden ritual or as addition beacuse of popularity of warrior decks. This is not tier 1 anymore. Too much removal, and yes, I will always draw it against this deck. I main zoo atm. My version is a bit faster than Yours and a bit slower than Trumps one. + 2x mortal coil (so many aggro in meta nowadays, and its simle 2 for 1. Also tested Moroes. Too slow, maybe he finds home in some token themed deck. @Klck Oh, missed that sorry and thanks for the spot! Just wondering why your list contains 29 cards. @Sonic1337 You can always consider 2nd Dark Iron Dwarf in a place of Sea Giant. Leeroy is hard to be replaced beacuse its a finnisher. You should look arround for something that cost 5-6 and make immediate effect on board. No idea if You can actualy find something. @Sonic1337 It depends very much on what you have in your collection. Leeroy gives you burst/surprise finish so I guess you want anything that charges. Reckless Rocketeer as a budget possibility? Do you have Gormok the Impaler? That used to be a common component of Zoo (in recent months at least), and gives you the same sort of minion-fuelled bonus effect of Se Giant albeit without the meaty stats on the board. replacements for Leeroy and Sea Giant ? I replaced the two legendaries with Mortal Coil and one Dire Wolf Wlpha + the Sea Giant with two Raid Leaders. It's working well and the deck's total cost is at about 1200 dust. In particular - Mortal Coil seems too important to replace it with something else. why does trump have a video featuring different cards than the list of cards for the zoo deck? I would have played Tap + Defender here. Also, shouldn't have he put the Darkshire Councilman between the Knife Juggler and Imp Gang Boss as he doesn't usually need a wolf as an activator. At 8:36 he explains that Argent Squires and Possessed Villages go on the edges, with priority to the right edge. Considering Forbidden Ritual (which puts the 1/1s to the right), shouldn't the left edge have priority so that these 2 minions don't stop the wolf+sliding combo? I'm running a deck similar to this one and I have a few questions on mulliganing. RE: Giants - Yep, totally viable. My preference is to have two of them though to play into the "many minions" flavour of the particular deck list. It's a fair swap if you want/need a fast finisher. RE: Dark Peddler - Oversight on my part, apologies! I've added the card to the Mulligan guide. @traianniţu01 Ah, my mistake. There was one mention of Voidcaller left in here from when this was more Demon-orientated. I've tidied it up now - thanks for spotting! I am sorry, you keep mentioning Voidcaller in the guide, but the card is not present in the actual deck you present. Please explain. @jasonsnodgrass44 Sooner or later, I always come crawling back to Zoo! I absolutely love this deck, its fluid it can be aggressive it can defensive. I switched out an imp-losion for a Shadowflame just to clear the board when I need to. is dark peddler an ok replacement for imp gang boss? and if i don't have mal'ganis yet is there another replacement demon until i get him? Going face on Nerubian Egg + Power Overwhelming in round 4 then playing Void Terror to buff it to at least 7/9 then having the 4/4 Nerubian has made my last 3 opponents forfeit. Nice run! Reading through your comment, you might actually like to have a play around with the Demon Control Warlock that's doing the rounds at the moment. That's got a lot of the cards you want to play with, but you'll need Sylvanas, Dr. Boom, Ragnaros and Lord Jaraxxus to get the most out of it. Links aren't working at the moment (tech are on it), but if you look under the Deck Guide section of the site, you should find our guide a few rows down. Well, I played this deck without a loss from 18-14 , so it seems pretty strong! (I haven't played much this or last season, hence the low start). In the end I ran afoul of a hunter that busrt me down. Imp-losion is dangerous there! Pre-GvG i took a zoo-lock to rank 4, and I miss the power overwhelming/nerubian egg/void terror combo from that. I might look to modify this deck a little, drop one or both imposions for void terrors and get a darkbomb in there somewhere, see how that fares. @Bedders Below 10 is great! I've only ever got to 14.